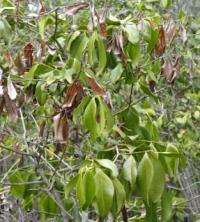 (PhysOrg.com) -- New research by UCLA life scientists could lead to predictions of which plant species will escape extinction from climate change. A fundamental difference between plants and animals is that plant cells are enclosed by cell walls while animal cells are not. To keep their cells functional, plants depend on "turgor pressure"  pressure produced in cells by internal salty water pushing against and holding up the cell walls. When leaves open their pores, or stomata, to capture carbon dioxide for photosynthesis, they lose a considerable amount of this water to evaporation. This dehydrates the cells, inducing a loss of pressure. The UCLA team has now demonstrated conclusively that it is the saltiness of the cell sap that explains drought tolerance across species. Their first approach was mathematical; the team revisited the fundamental equations that govern wilting behavior and solved them for the first time. Their mathematical solution pointed to the importance of saltier cell sap. Saltier cell sap in each plant cell allows the plant to maintain turgor pressure during dry times and to continue photosynthesizing and growing as drought ensues. The equation showed that thick cell walls do not contribute directly to preventing wilting, although they provide indirect benefits that can be important in some cases  protection from excessive cell shrinking and from damage due to the elements or insects and mammals. "We were surprised to see that having a stiffer cell wall actually reduced drought tolerance slightly  contrary to received wisdom  but that many drought-tolerant plants with lots of salt also had stiff cell walls," said lead author Megan Bartlett, a UCLA graduate student in the department of ecology and evolutionary biology. Even though the team showed that turgor loss point and salty cell sap have exceptional power to predict a plant's drought tolerance, some of the most famous and diverse desert plants  including cacti, yuccas and agaves  exhibit the opposite design, with many flexible-walled cells that hold dilute sap and would lose turgor rapidly, Sack said.